Dorrie Rifkin, our third Painter in Residence for the 2014 season, set out in the park in recent weeks to create her own Bryant Park masterpieces. Ms. Rifkin is a native of Englewood, New Jersey, and is an award-winning art director, watercolor instructor, and typography admirer. Her paintings have won multiple prizes and have been displayed in many noted galleries and showings. Among these accomplishments, Ms. Rifkin's painting of neighboring Grand Central Terminal was selected for the cover of the station's Connections, which celebrated the terminal's 2011 centennial. 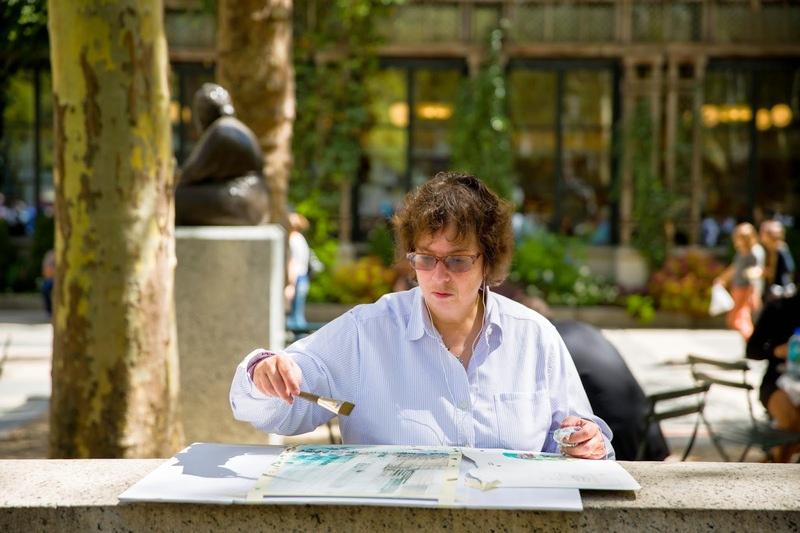 Ms. Rifkin concentrates on an intricate watercolor painting of the Eastern side of the park. Ms. Rifkin also feels lucky to live in a place full of inspiration: "I'm lucky to live close to New York City; I spend a lot of time there. When I go to the city I usually bring a camera or sketchbook. Running out of things to paint would mean that I am not doing much of anything with my life." 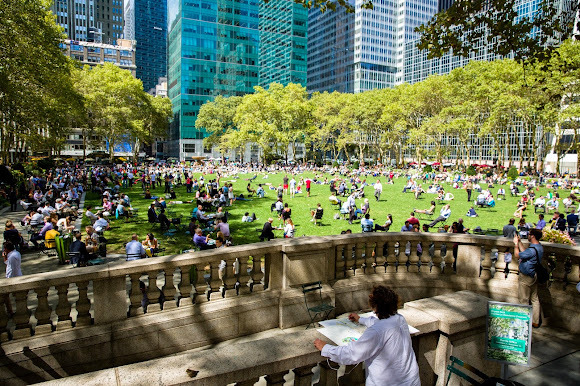 Ms. Rifkin paints on the Upper Terrace as a bustling Bryant Park unfolds beneath her on the lawn. To learn more about Dorrie Rifkin and her work, visit her website. And don't forget to stop by the park in the coming weeks to see our final Painter in Residence for this year, Anne Kullaf.